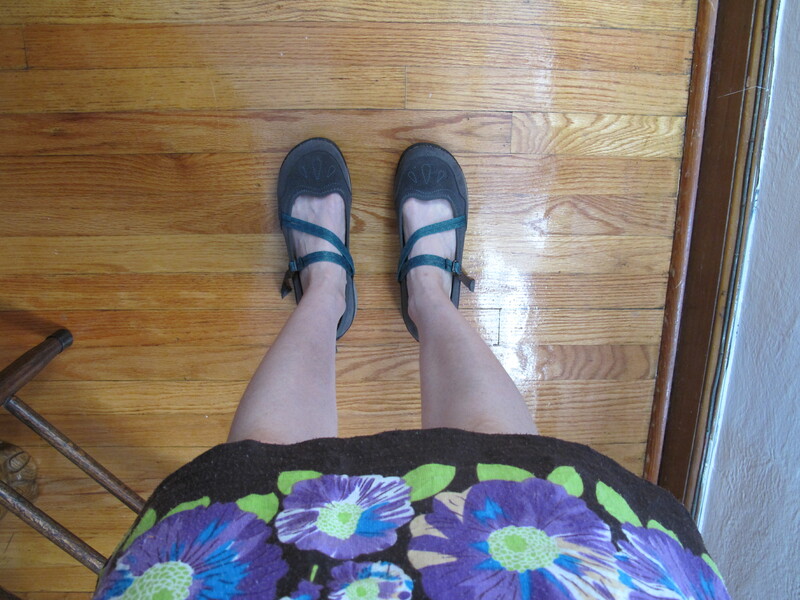 In the fall of 2010, after I enjoyed biking around Chattanooga in sandals, I relaxed my “only bike in closed-toe shoes” policy, and started biking in sandals. Sturdy sandals with backstraps (my Birks and Tevas), but still, sandals. It felt great in the summer, and it was convenient. Sandals looked better with skirts or capri pants, and, if I was headed to a destination where I wanted to wear sandals, I didn’t have to worry about wearing tennis shoes, changing into sandals, and lugging my shoes around. This practice lasted for about two years, then came to a screeching halt when Matthew had a bike crash (a solo fall, due to a structural failure in his bike) in the fall of 2012. He was wearing his Teva sandals at the time, and, other than a few scrapes, his sole injury was a sprained big toe. Sounds like a little thing, but it was a fairly bad sprain, and it turns out it’s rather difficult to walk when one of your toes is out of commission. Since wearing closed-toe shoes almost certainly would have prevented this injury, I reluctantly reverted back to my former policy. But I wasn’t satisfied — there had to be some middle ground, something closed-toe (and comfortable) that looked halfway decent with skirts and dresses. I tried [close-toed] Keen sandals, but I didn’t like the way the foot bed felt with bare feet, and I wasn’t crazy about the appearance. 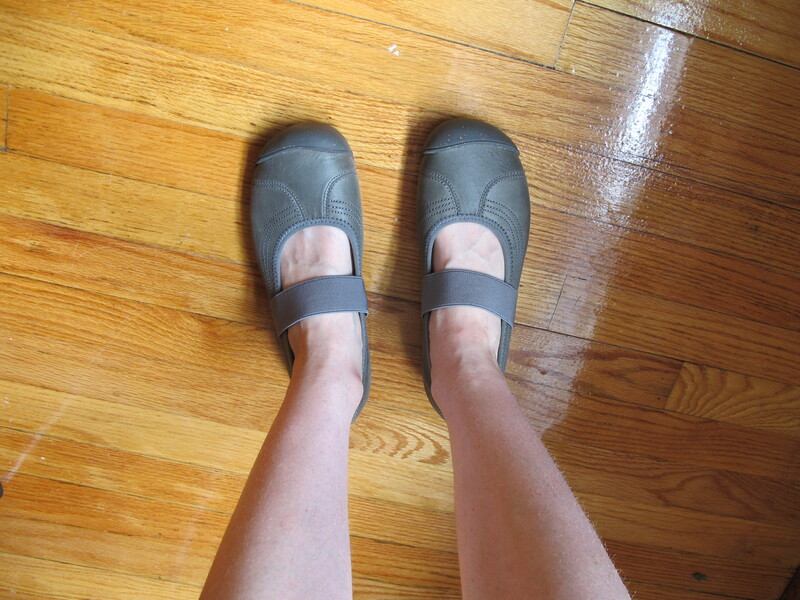 At the end of last summer, I purchased a pair of Mary Jane-style Crocs. They were comfy and decently attractive, but after a few rides, I decided they weren’t quite what I was looking for. They met the letter of my closed-toe policy, but with thin, very flexible soles, they didn’t feel terribly protective. 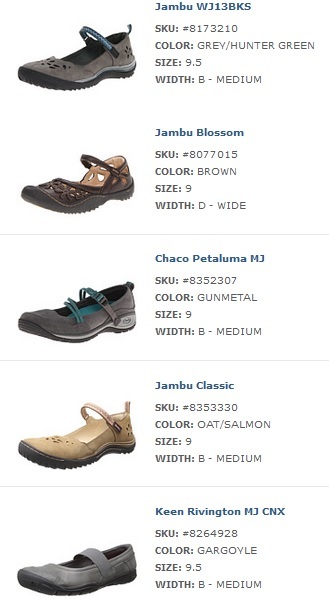 After researching and considering, I narrowed my selections to Keen and Chaco Mary Janes. When I went to order various styles and sizes to try, I saw a third brand, Jambu, that looked interesting. 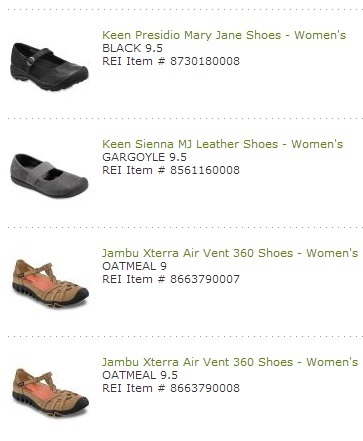 The Jambu’s from REI were cute, and also on sale for half off. Alas, the toe box was just a bit narrow (on the big-toe side). You know, more of a “traditional” shoe shape, and less of a foot shape. I put on the Keen Siennas, and they seriously felt like slippers. I was nearly sold, but I was still awaiting a Zappos order with some other options. When this order arrived, I tried on the Jambu shoes, knowing that they were likely already out, due to the toe box fit, and that was indeed the case. 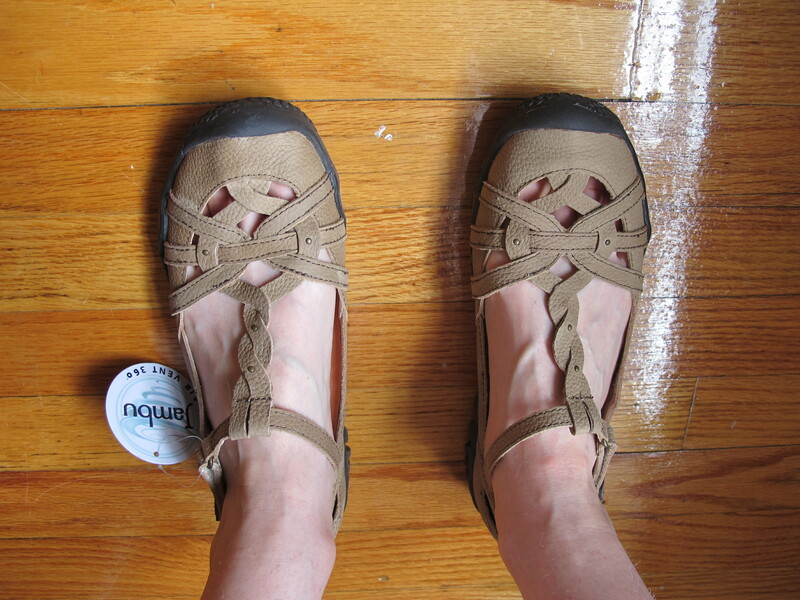 The Keens in my Zappos order were VERY similar to the Siennas, despite being a different model. Then there were the Chacos. The Chacos had the same, immediately comfortable feeling that I’d loved in the Keen Mary Janes and similarly good toe box shape. 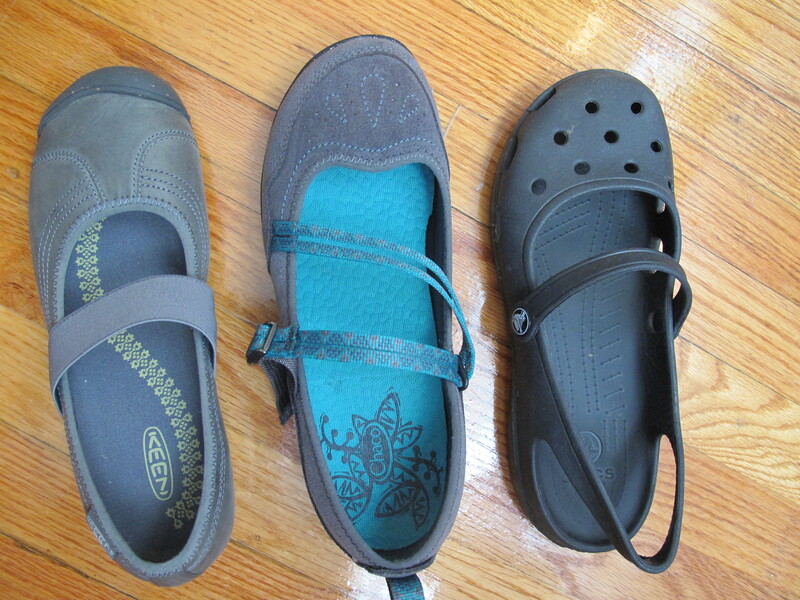 From left to right: Keen Sienna, Chaco Petaluma, and my Crocs. The Chacos seemed wide not just in the toe box (where I wanted the room), but throughout the rest of the shoe (where I didn’t want the room), so the Keen Siennas won. I wore them on the bike for the first time on Sunday. The foot bed didn’t feel quite as great once my feet were sweaty, but it wasn’t bad, either. They have a thick, firm sole, and the extra bit of rubber covering the toe, and the strap keeps them on securely. Something about them (perhaps the open top?) makes these feel less protective than a tennis shoe, but I’m not sure I’m going to find anything better (that also fits the look I’m going for). When it comes to bike apparel, I think it’s about finding a happy medium. Could I be wearing more protective shoes? Absolutely! I could, for example, wear nothing but steel-toed boots when I ride my bike. My feet would be really, really safe, but I would probably be pretty uncomfortable. I also know plenty of people who enjoy biking in sandals (or dress shoes), but that’s just not me, at least not right now. This entry was posted in Biking and tagged how I ride. Bookmark the permalink. I was wondering about potential odor issues (certainly a problem with my Vibram Five Fingers — those things STINK, and no amount of washing helps at this point). Maybe I should start wearing the Keens with those little no-show socks. It would technically make them warmer, but it might feel less sweaty, making it an okay trade-off. The heel cut on the Chacos is a bummer. Not sure if that was just this style, or true of all their shoes. The footbed on the Chacos was probably my favorite. I don’t know if this is true or not, but I’ve heard that putting smelly shoes in the freezer can help. Supposedly the cold kills off the bacteria that causes the smell. I’ve never tried it because the only shoes I’ve ever had that ever stink are my Tevas which are easy to wash. If anybody tries it though, I’d love to know if it works or not! I share your shoe woes – why is it so hard to find shoes that are actually shaped like a foot! I used to wear my Tevas for casual riding in the summer until one time when I had to make a really sudden skidding foot-down stop, and tore my big toenail half way off. I’ve considered getting some crocks for gardening, but the flexible sole worries me… like if you stepped on a nail or something you’d be totally hosed! Have you ever had any problems with them? Yes, the “ugh” factor with shoe shopping is why I went with the online version, even though I really prefer to shop local (though in the end, I kind-of did shop local — since we have an REI store in StL [county], we pay sales tax on online purchases). I got lucky in ordering the correct size the first time in the shoe I ended up keeping. My orders would have been a lot smaller if I knew the Jambus wouldn’t work. I probably would be in trouble if I stepped on a nail or big piece of glass in the Crocs, but it hasn’t happened yet. I agree that they’re good garden shoes (except for the “heavy lifting” tasks, like using a big shovel or operating a tiller — boots win for that second one, especially! ).